Almost all of the cities of the Philippines are situated in proximity of rivers, with settlements along the waterways that are highly vulnerable to floods. Effective risk communication – the real time exchange of information between experts, officials and people facing a threat to their wellbeing – can help communities be better prepared and respond timely when disasters occur. The National Disaster Risk Reduction and Management Framework includes provisions for risk communication – but how are these provisions implemented at the local level? The study aimed at identifying and analyzing risk communication strategies of riverine communities in six cities in the Philippines. In particular, the research aimed at identifying how local governments are mainstreaming the risk communication provisions of the National Disaster Risk Reduction and Management (DRRM) Framework and at providing policy recommendations to address any gaps. Six cities within major river basins were identified, from the three island clusters – Luzon, Visayas and Mindanao. Focus group discussions, interviews and site visits were conducted to identify the local risk communication strategies and document initiatives of the local government. All of the cities analyzed address risk communication in their disaster plans. 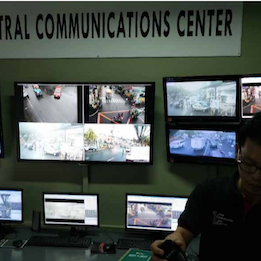 All risk communications strategies, even though at different stages of approval and implementation, are aligned with the standards set by the DRRM Framework. Examples of risk communication from the six cities include agreements with local radio and television stations to provide preparedness messages and timely announcements in case of flooding; mobile applications that allow users to report and access real time information about the floods; and investments in dedicated teams to monitor and share content on social media platforms. Several factors affect the quality of risk communications strategies, including awareness among local leaders, access to funding, and community engagement. Risk communication strategies compliant with national standards have been drafted in all the selected cities. Because of the lack of centralized coordination and support, the strategies are often prepared with the help of external organizations, leading to inconsistent quality. Districts with better knowledge of disaster risk reduction, more resources, and more support from the communities tend to have better strategies. The findings of this research were presented to the National Disaster Risk Reduction and Management Council – Technical Management Group. It was also presented during the Urban Environmental Accords, Melaka Summit in Malaysia in 2017 and during the National Executive Board meeting of the League of Cities of the Philippines, where mayors had the opportunity to learn about strategies and approaches in place in the six cities analyzed during the study. The findings were also used by the League of Cities of the Philippines to draft resolutions supporting the prioritization of risk communication to riverine communities.